Aqua One Brilliance 100 Rectangular 225L Aquarium Set BlackThe Aqua One Brilliance aquarium uses low iron white glass which is brighter and clearer than normal glass. This allows the colour of plants, ornaments and fish to be viewed as natural as possible!Each Set Includes:Complete aquarium with hood and cabinetCanister filter with filter mediaAqua One glass heaterT5 light unit & tubesAll connectionsAdditional Info:Item Code:54108BKType:Coldwater, TropicalColour:BlackDimension:100W..
Aqua One Brilliance 120 Rectangular 292L Aquarium Set BlackThe Aqua One Brilliance aquarium uses low iron white glass which is brighter and clearer than normal glass. This allows the colour of plants, ornaments and fish to be viewed as natural as possible!Each Set Includes:Complete aquarium with hood and cabinetCanister filter with filter mediaAqua One glass heaterT5 light unit & tubesAll connectionsAdditional Info:Item Code:54109BKType:Coldwater, TropicalColour:BlackDimension:120W..
Aqua One Brilliance 120 Rectangular 292L Aquarium Set WhiteThe Aqua One Brilliance aquarium uses low iron white glass which is brighter and clearer than normal glass. This allows the colour of plants, ornaments and fish to be viewed as natural as possible!Each Set Includes:Complete aquarium with hood and cabinetCanister filter with filter mediaAqua One glass heaterT5 light unit & tubesAll connectionsAdditional Info:Item Code:54109WHType:Coldwater, TropicalColour:WhiteDimension:120W..
Aqua One Brilliance 150 Rectangular 398L Aquarium Set BlackThe Aqua One Brilliance aquarium uses low iron white glass which is brighter and clearer than normal glass. This allows the colour of plants, ornaments and fish to be viewed as natural as possible!Each Set Includes:Complete aquarium with hood and cabinetCanister filter with filter mediaAqua One glass heaterT5 light unit & tubesAll connectionsAdditional Info:Item Code:54110BKType:Coldwater, TropicalColour:BlackDimension:150W..
Aqua One Brilliance 180 Rectangular 580L Aquarium Set BlackThe Aqua One Brilliance aquarium uses low iron white glass which is brighter and clearer than normal glass. This allows the colour of plants, ornaments and fish to be viewed as natural as possible!Each Set Includes:Complete aquarium with hood and cabinetCanister filter with filter mediaAqua One glass heaterT5 light unit & tubesAll connectionsAdditional Info:Item Code:54108BKType:Coldwater, TropicalColour:BlackDimension:180W..
Aqua One Horizon 130 Glass Starter Kit 130LUltra stylish, economical and contemporary, the new range of Aqua One Horizon Starter Kits make a beautiful addition to any room! The Horizon Starter Kits contain everything you need to create the ultimate fish environment, including a hang on filter, heater and lighting to bring out the vibrant colours of your fish. The kits also include an easy to assemble stand which offers two handy shelves designed to take up minimal space.Features & Benefits:E..
Aqua One Horizon 182 Glass Starter Kit 182LUltra stylish, economical and contemporary, the new range of Aqua One Horizon Starter Kits make a beautiful addition to any room! The Horizon Starter Kits contain everything you need to create the ultimate fish environment, including a hang on filter, heater and lighting to bring out the vibrant colours of your fish. The kits also include an easy to assemble stand which offers two handy shelves designed to take up minimal space.Features & Benefits:E..
Aqua One Horizon 65 Glass Starter Kit 65LUltra stylish, economical and contemporary, the new range of Aqua One Horizon Starter Kits make a beautiful addition to any room! The Horizon Starter Kits contain everything you need to create the ultimate fish environment, including a hang on filter, heater and lighting to bring out the vibrant colours of your fish. 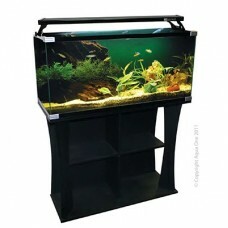 The kits also include an easy to assemble stand which offers two handy shelves designed to take up minimal space.Features & Benefits:Eas..
Aqua One MiniReef 120 Marine Set 120LThe Aqua One MiniReef is a complete reef aquariumsystem consisting of high quality accessories that help to provide an ideal habitat for marine fish and corals. The in-sump filtration system keeps equipment out of sight, providing optimum viewing conditions for your aquarium.Features & Benefits:Inbuilt filtration system eliminates unsightly piping running from outside of tank to filter unit.Comes with an Aqua One Filter Sock.The i..
Aqua One Reef 195 S2 Marine Set 195LThe Aqua One AquaReef 195,300 & 400 Series 2 has everything you need in order for you to enjoy a slice of the coral reef in your home or workplace. The AquaReef series 2 is a sophisticated marine system that has been rigorously designed and tested to ensure that your marine setup will run efficiently, and provide you with exceptional water quality.Features & Benefits:New features compared to AquaReef Series 1:• 1st Series has a wet/dry filter and T5 Li..
Aqua One Reef 300 S2 Marine Set 300LThe Aqua One AquaReef 195,300 & 400 Series 2 has everything you need in order for you to enjoy a slice of the coral reef in your home or workplace. The AquaReef series 2 is a sophisticated marine system that has been rigorously designed and tested to ensure that your marine setup will run efficiently, and provide you with exceptional water quality.Features & Benefits:New features compared to AquaReef Series 1:• 1st Series has a wet/dry filter and T5 Li..